Cutting grass with a lawn mower is easy. It’s built to cut evenly without the user needing any specific skill to get good results. However, there are areas of your yard that may be inaccessible to your mower or that may be unsafe to run the lawn mower through. Rather than giving up, for situations like these use an electric or battery powered weed wacker. With an electric grass trimmer like the Worx GT Revolution 20V Cordless String Trimmer/Edger/Mini-Mower, you can easily cut the areas of the yard where a lawn mower is not suitable. The 20V batteries provide plenty of run time, and it is well balanced and easy to handle. The battery powered grass trimmer also has an adjustable head that converts the unit into a grass edge trimmer. While using one of the best battery powered weed eaters will often help make the job easier, it does require having some technique and a little bit of practice. This post will go over the safety precautions for using a string trimmer, how to cut grass by holding the tool evenly and go from low to high, and what to do after you’re done with the task at hand. Beyond having a good electric or battery powered weed trimmer, you are also going to want to make sure you have some safety gear. For the most part, it is very safe to operate a battery powered or electric grass trimmer, but there is always a chance that the machine will kick off debris. At the very least, look to wear some eye protection and a pair of closed-toe shoes. However, it’s also a good idea to wear long pants and gloves. You should also inspect your electric or battery powered weed wacker to make sure everything is secure and in good working order. Cutting grass with an electric or battery powered weed trimmer is slightly different from using it to remove weeds. Since you are trying to get an even cut, hold the head even with the ground and make short sweeping motions as you trim. You also want to be careful not to cut the grass too short. For this reason, it can be a good idea to start high and work your way down to the desired level. Look for any rocks, sticks, or debris in the area that is to be trimmed. These can be a hazard when running your weed wacker, so you want to get them out of the way before you start to cut. Start your electric or battery powered weed trimmer and hold it so the handle is snug against your hip. Look to see where the head is and make sure it is at a comfortable height for trimming the grass. Go to one edge of the area to be cut and start trimming the grass. Remember, you want to hold the battery powered or electric grass trimmer level to the ground and make passes using a short swinging motion. As you go along, just overlap the passes to get all of the grass in the area. Once you have the area at a uniform length, you can then turn your electric or battery powered grass trimmer to edge the grass. If you have a standard grass trimmer, you will need to turn the whole unit so the head is vertical. 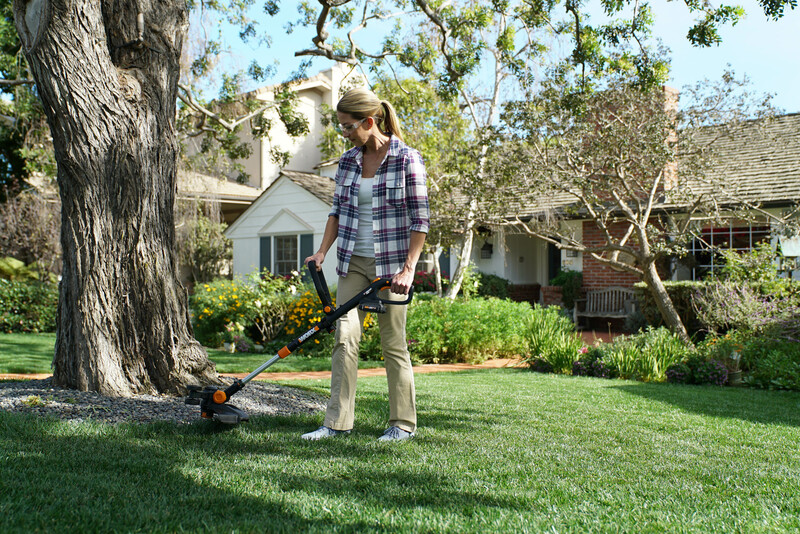 With a model like the Worx 56V Cordless String Trimmer & Wheeled Edger, the head is designed to turn for use as a grass edge trimmer. That will make it easier to get nice clean edges around your grass. Once you are done trimming the grass, you want to clean your electric or battery powered weed wacker and put it away. If you were cutting near a patio or deck, you might want to see if the area needs to be cleaned. For small spaces, you can simply clean up with a broom. If the area is a little larger, a more efficient method, like using a leaf blower, will make the job easier. Keep these tips in mind when looking for your best electric or battery powered weed eater and maintaining a beautiful, even lawn will be easy. A good electric or battery powered weed wacker can be like two tools in one if you choose a model that’s designed to turn into a grass edge trimmer as well. Make lawn care even easier by using the best tools: Shop the WORX collection of electric and battery powered grass trimmers/weed wackers/edgers. Consider the safety precautions for using a string trimmer, cut grass by holding the tool evenly and go from low to high, and clean the tool and area after you’re done with the task at hand.